Formulations are developed in the biopharmaceutical space as a set of solution conditions that lead to the highest stability of a therapeutic substance such as an antibody protein or peptide. The solution conditions that generally affect the stability of the solute are solvent choice, ionic strength, pH, excipient, surfactant and sample concentration. Because many current techniques do not monitor aggregation as a kinetic process, researchers are forced to prepare a matrix of many samples that have varying formulation conditions, place these samples into a long-term storage incubator, and then wait for extended periods of time to determine if aggregates have formed to a detectable level. This is obviously a very time consuming and laborious process that drives companies to seek tools that provide rapid, high quality stability information with low sample consumption. ARGEN, by Fluence Analytics, provides this information and allows independent and realtime testing of up to 16 simultaneous samples. ARGEN monitors many simultaneous light scattering experiments to resolve changes in the weight average molecular weight of each formulation. Testing each sample independently allows for control and rapid characterization of multiple formulation conditions with respect to the overall stability of the solution. Researchers can develop a series or matrix of formulation conditions to test, thereby screening for the minimization of a sample’s aggregation rate. The high sensitivity of static light scattering to aggregate formation coupled with independent control of the temperature and stirring means that the screening process is reduced to weeks rather than months. where Mw(t) is the molecular weight of the sample as represented by the light scattering intensity throughout the experiment, and Mo is the initial molecular weight of the sample before aggregation takes place. In this example, Figure 1 shows how ARGEN determines AR for a stock solution of human immunoglobulin G (IgG) over a broad range of temperatures. This information is used to determine any Arrhenius behavior and the extent of any thermally controlled aggregation phenomena. This data indicates that at pH 5, near the isoelectric point, there are three regimes of aggregation. This also shows that thermally controlled aggregation behavior is lost at temperatures below 47 °C. 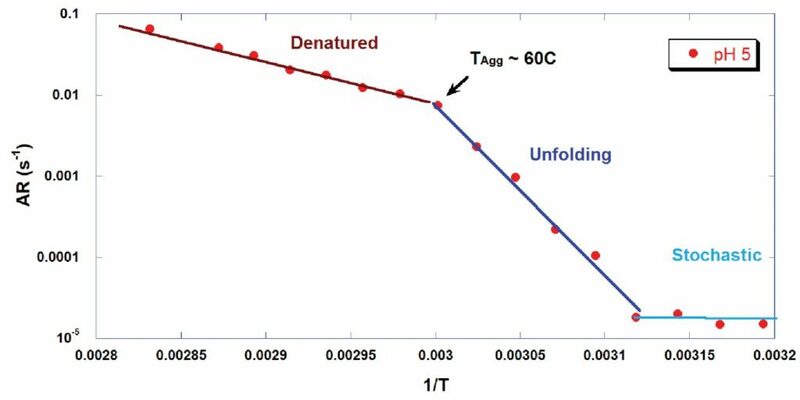 This is an indication that stochastic influences, such as shaking, contamination or other intermolecular interactions, are dominant over thermally influenced unfolding and aggregation behavior. 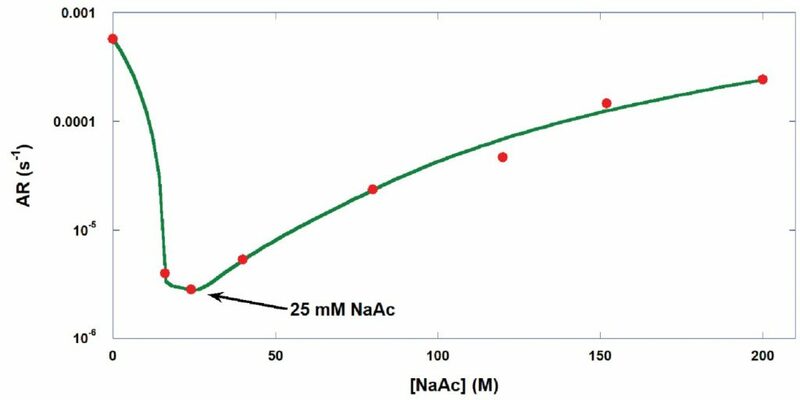 Once understanding the overall stability of the sample, ARGEN is used to determine what buffer concentration, in this case Sodium Acetate (NaAc), is sufficient for minimizing interactions between the molecules. Rather than conduct these studies over an extensive range of temperatures, a single temperature is chosen sufficiently below the TAgg temperature. This temperature of 55 °C is chosen so that a sufficient degree of aggregation will occur over a 24-hour period but not so fast that rate limiting kinetics cannot be determined from the data. As seen in Figure 2, the AR decreases as the buffer concentration is increased to 25 mM. After this, the AR again increases as the concentration is increased beyond the optimal loading level. From this data, the sample prepared with a concentration of 25 mM is selected as the optimal concentration. In further developing the stability of the sample and formulation conditions, a set of experiments is conducted to study the effect of sucrose concentration to that of further inhibiting the molecule against unfolding. Again, rather than running an extensive range of temperatures, 55 °C is used. As shown in Figure 3, the AR of the chosen pH 5 solution steadily decreases as the sucrose concentration is increased to 200 mM. Further increasing the concentration of sucrose beyond 200 mM produced marginal returns. 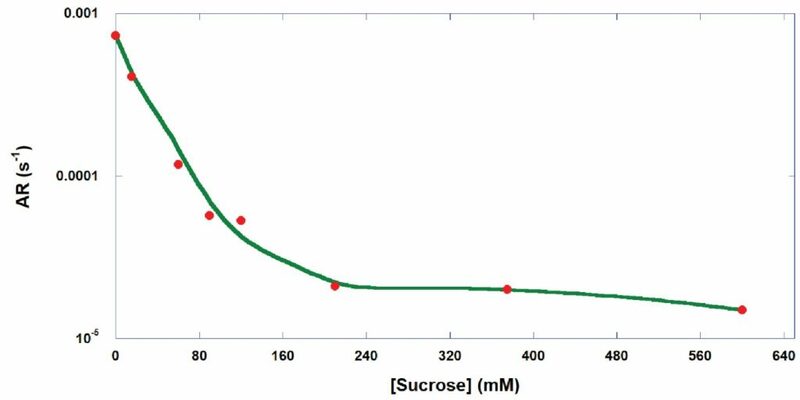 From this data, the concentration of 300 mM sucrose was picked as the optimal concentration. From the conditions determined through the set of previously conducted experiments, a formulation of 25 mM NaAc and 300 mM sucrose at pH 5 is prepared to carry the IgG sample. 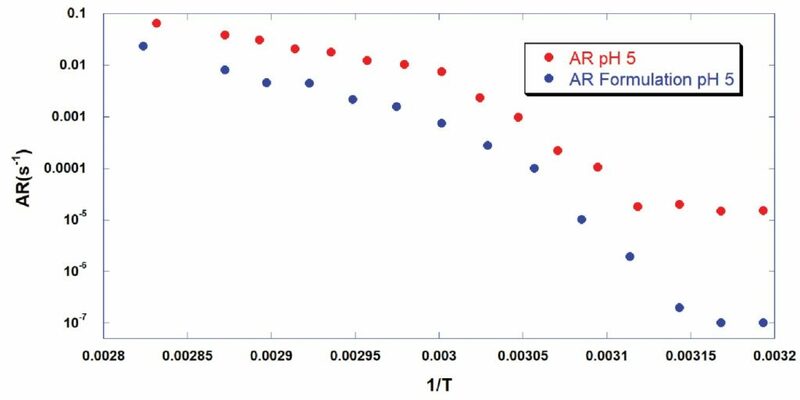 To demonstrate the overall effect of increased thermal stability, another Arrhenius plot is generated across the same temperature range as for the un-formulated IgG solution. As depicted in Figure 4, the ARs for the sample at each temperature is significantly reduced. Additionally, the thermally rate limited Arrhenius behavior extends to lower temperatures and no observable aggregation was measured at temperatures below 40 °C. This is a very significant development as this effect further reduces the propensity for the sample to aggregate because of stochastic interactions and allows researchers to further predict the shelf life and stability of the sample at typical storage conditions. Data shows that ARGEN can easily and quickly screen the stability characteristics of a molecule under a series of deliberate and quantifiable experimental conditions, including temperature, ionic strength and excipient concentration. Understanding the kinetics of aggregation as a measure of the AR value to determine how each formulation component affects the molecule’s propensity to aggregate is an important measure in determining the precise concentrations and conditions to developing a suitable formulation. Taking these factors into account will reduce the likelihood of failure in developing satisfactory formulations for lengthy and expensive long-term storage studies.